Nichols and Sons Tree Surgeons are a family run tree surgeons based in Sutton, Surrey we have many years’ experience and an excellent reputation for providing professional tree surgery services in Sutton, Surrey and the surrounding areas of Mitcham, Epsom, Kingston, Cheam, Worcester Park, Carshalton, Raynespark. We provide services to both domestic and commercial customers. So whether you have one tree or hedge in your garden which needs trimming or an estate or commercial premises or school or college with hundreds of trees then we can help. We can provide tree surveys and maintenance recommendations as well as identifying dangerous or dying trees. We can help with planning and development applications and tree protection plans. Nichols and Sons Tree Surgeons have developed an excellent reputation over the years and have worked with many schools, colleges, churches, estate agents, developers and domestic customers. 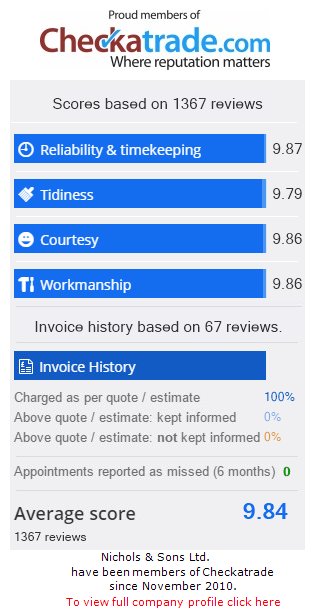 We are checkatrade registered and pride ourselves on our excellent feedback from many satisfied customers. Our staff are NPTC qualified and we hold full public and employers liability insurance. We have been offering expert tree surgery in Sutton and across Surrey area for more than 30 years. Nichols and Sons Tree Surgeons are based in Sutton and cover Wimbledon, Mitcham, Morden, Cheam, Ewell, Epsom, Carshalton, Kingston, New Malden, Worcester Park, Raynes Park, Streatham, Tolworth, Kingston and the surrounding areas. Nichols and Sons usually work withing the area shown here. However we do sometimes travel beyond this to complete work, feel free to give us a call to discuss your requirements and location.